There are three popular ways to train your puppy to sit. [wp_ad_camp_5]We’re going to look at each one in turn. We’ll check out the pros and cons. And help you decide which way is right for you. This is not about teaching a dog to sit in all kinds of different and distracting circumstances, or to stay sitting for long periods of time. 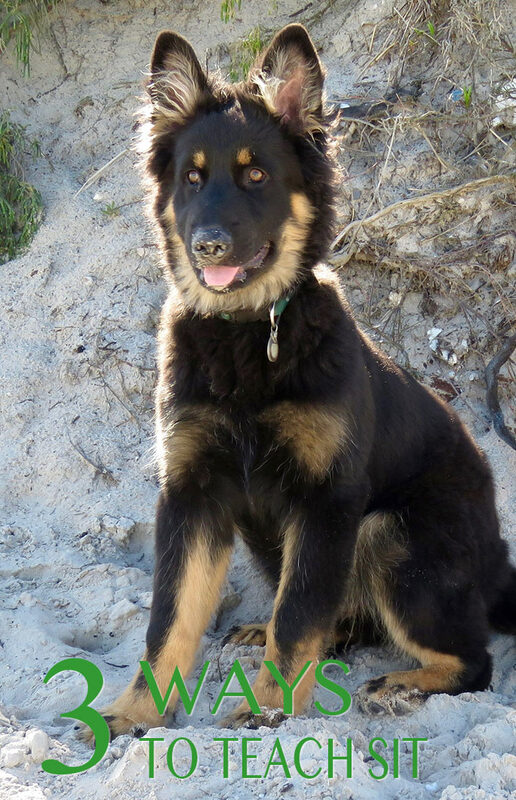 It is about the very first stage of sit training – getting the dog into the sit position. Sitting when told, is an important skill for all dogs. So it’s fortunate that sit is a natural resting position for your puppy. Of course, sitting when he wants to, and sitting when you want him to are very different things. If you want your puppy to sit reliably each time you say sit, you’ll need to spend some time training for this. Don’t worry, its fun and simple! Here are those three popular methods we mentioned. We’ll take a look at modelling first. [wp_ad_camp_2]Training a dog through ‘modelling’ is a very traditional process. You’ll almost certainly have seen lots of people doing this. The idea with modelling is to physically place the dog into the position you require, whilst at the same time giving a command. Trainers that use modelling to teach the sit, usually press down on the dog’s bottom whilst keeping the puppy’s head up by maintaining tension, or pulling up, on his collar or lead. At the same time, they say the word SIT. Once the dog is in the sit position the pushing stops and in some cases he will be rewarded with stroking. After many repetitions, the dog begins to realise that if he sits when he hears the word SIT, he won’t have his bottom pushed down. One of the main problems with modelling is that the ‘muscles don’t match the command’. This is because dog’s will work to avoid physical pressure. Dogs don’t particularly like being pushed, and when you push on an untrained dog’s bottom he will resist and push back. This ‘pushing back’ behaviour involves a set of muscles movements that are very different from the muscle movements required for the dog to drop or relax into a sit position. This mixed message is confusing for the dog’s brain because he is hearing a word (SIT) and is associating it with a ‘memory’ of muscle activity that creates the very opposite of a sit. We know from human athletes how important muscle memory is to fast and effective learning of physical skills. And it would seem likely that the same applies to dogs. Indeed, the evidence suggests it does, as learning physical positions and movements is a much quicker process for our puppies if we use one of the next two methods. Let’s look now at method number two, and see if that is any better. This method is very simple. You just wait for your dog to sit and mark the sit with a distinctive signal. Don’t say sit. He doesn’t know what it means and you will just confuse him. Give this exact same signal, each and every time he sits, and make the signal special by following it immediately with a tasty treat. Every time. What is the signal for? This is called event marking. And we call the signals we use to mark behaviour, event markers. Event markers have revolutionised dog training. They allow us to tell dogs what they did right. An event marker says “Yes, I liked it when you did THAT” It is a powerful communication and training device. The signal you use for marking events, or actions that your dog does that you approve of, could be a whistle, a word, or a click from a clicker. For a deaf dog you could use a flashing light or a ‘thumbs up’. It is probably best not to use a whistle for an event marker, as we’ll be needing whistles for giving cues to our puppy later on in training. Cues are the signals you use to tell your dog what you want him to do next, like the whistle you blow to recall your dog when he is far away. Don’t forget – this signal is not used to tell the dog what to do, it isn’t a cue – it is to tell the dog when he has done something you like. Because we always follow an event marker with a reward, usually a food reward, the dog will try to make the event marker – your signal – happen again. He will try to earn the next ‘click’ or the next ‘GOOD’ from you, as he associates the signal with a treat. Because the dog is actively trying to figure out what you want, and because sit is a natural position for a dog, he will rapidly start sitting over and over again, just to hear that signal and get that treat. The only downside to ‘capturing’ a sit, is that you need a bit of patience to get the ball rolling, to get those first few sits under your belt. It takes the dog a few attempts to figure out what exactly he is doing in order to get the right outcome. In most cases this is not a problem. But, some dogs ’sit’ less than others, and with some puppies, you could spend quite a bit of the first session hanging around waiting for those first few sits. If you don’t want to wait and capture your dog in the sitting position, then the next option is another great alternative. Let’s look at luring. Generally speaking, food should not be offered to dogs in order to induce them to behave in a particular way. Offering food in advance would normally be regarded as ‘bribing’ and it’s a bad idea to bribe dogs, because it doesn’t teach them anything. 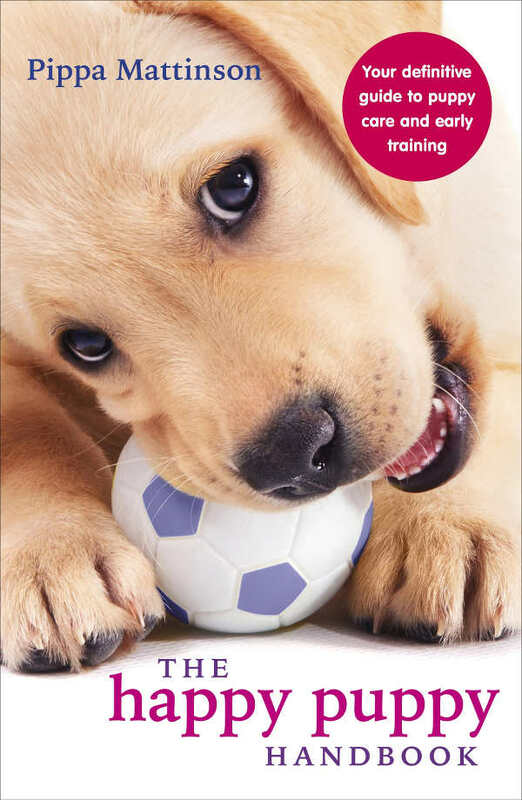 We therefore restrict the use of food in puppy training, to providing rewards for behaviour that has ‘already happened’ With the exception of luring. What is a lure for? 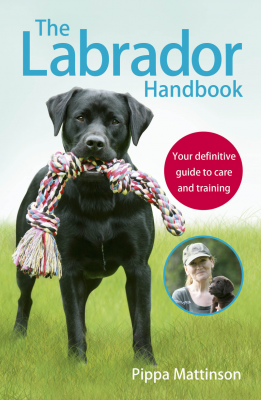 A lure is used specifically to get the dog into a certain position, or to move in a certain way, so that you can mark (with your clicker) the completed action, and reward the dog for achieving it. For example, the dog comes when you whistle, and he gets a treat. As opposed to the dog comes because he sees you waving food about. A dog that has been bribed to ‘come’, is unlikely to ‘come’ when there is no treat on offer. To lure the sit, all you need do is hold a small piece of food above your puppy’s nose, just out of reach, and move it slowly over his head in the direction of his tail. Do not say SIT, he does not know what it means yet. As he follows the treat with his nose, his bottom will sink automatically into a sit. At which point you give your marker signal – a click from your clicker for example – and release the treat into his mouth. The downside of luring is that it is very easy to get stuck with the lure, and to end up having to bribe the sit every time. The answer is to use it and lose it. Try not to use the lure more than three times. Then show the puppy your empty hand and immediately repeat the arm movement you made when you had the lure in your hand. He will almost certainly follow your hand in just the same way as he did with the lure in it, and drop into a sit. Don’t forget to mark and reward this important event! Event markers have changed the world for dogs. Because event markers enable us to capture behaviours they have tranformed the way we train our dogs, this is particularly important with puppies. We used to have to wait until puppies were five or six months old to start serious training. Simply because methods were too stressful and forceful for baby dogs. This is no longer the case. You can start training tiny puppies using event markers and edible rewards. There is no pressure or stress involved. 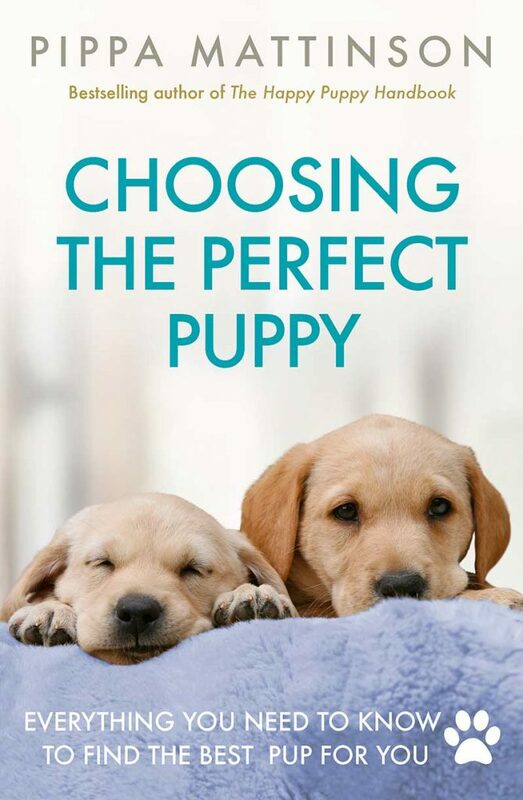 Puppies can now learn without ever being punished or pushed and pulled around. And training is a lot more fun. Once your dog has discovered that ‘sitting’ earns him some great rewards, you can teach him our word for what he is doing. To begin with, only say the word sit just before he is about to sit. Get the word in just as his bottom is heading for the ground. If you say SIT and he changes his mind and doesn’t sit, don’t repeat the cue! Give your cue one time only, and if he doesn’t sit immediately, lure him into a sit as described above. Then wait and capture a few sits, to get him back in the flow of things, before giving another SIT cue. When your puppy will sit promptly on cue in your kitchen, start practicing in another room. Then another. Then try out your cue in front of a family member or familiar friend. Practice, practice, practice in places where you know he will succeed, and don’t be in a hurry to ‘test’ him in public places or where there are other dogs around. Modern methods like capturing and luring are the fastest and most fun way to establish simple behaviours like ‘sit’. [wp_ad_camp_1]Get the puppy sitting repeatedly in his attempt to earn a treat, before adding a cue. With a few exceptions, the use of event markers has been widely adopted by dog trainers all over the world. Don’t get left behind. 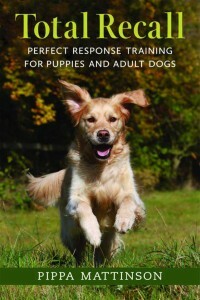 Get yourself a clicker and get training with your puppy. You don’t have to hang around waiting for a sit if you don’t want to. I suggest you start by capturing and then lure a couple of times if you get bored. Don’t forget, just like all puppy training, get the behaviour you want your puppy to carry out well established in a quiet, private place, before adding distractions and disturbance. Just you and your puppy, at home, is the best way to begin. i have two of your books happy puppy and total recall i have a 12 wk old female choc lab,my that we brought home at 7 weeks of age she is an awesome little puppy a very fast learner with an incredible pedigree.she sits and stays comes at a dead run when called knows her name .Her first night with us was her only bad night since she has been perfect she kennels on command sleeps thru the night without a wimper or accident.she rings the bell to go outside i have trained her to go in one spot as i have 4 acres and lots of people around i dont want to be running around looks for landmines.! Now for her one habit i am having problems with biting i have not had a puppy in 30 yrs and i have never had a puppy that bites like she does she has my wife terrified of her she jumps and growls and i am having no luck with the clicker approach nor time out our leaving her alone.she just gets right back at it as soon as she is released from her kennel or you return to the room. the breed is away ,actually he is in england to study english training and field trial events . by the way abby is her name and she is a doll other than this biting so far i am not greatly worried but i dont want it to progress into something worse .